From June 1998 to May 2006, he was a member of the Executive Board of the European Central Bank, responsible for the Directorates General Economics and Research. Until May 1998 he was a Member of the Board of the Deutsche Bundesbank with a seat in the Central Bank Council. Prior to that he held Chairs of Economics at the Universities of Würzburg and Erlangen-Nürnberg. From 1988 to 1990, he was a member of the German Council of Economic Experts. Issing is an active member of the Akademie der Wissen­schaften und der Literatur (Academy of Sciences and Literature), Mainz, and of the Academia Scientiarum et Artium Europaea (European Academy of Sciences and Arts). 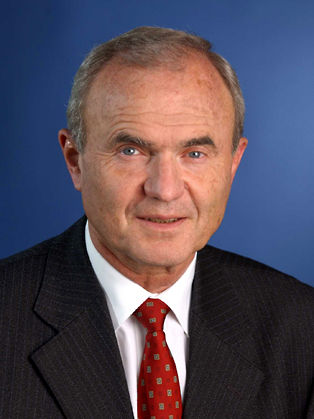 Prof. Issing has received numerous awards and prizes: In 2006 he was awarded the Große Verdienstkreuz des Verdienstordens der Bundesrepublik Deutsch­land. In the same year he was appointed Grand Officier de l`Ordre de Mérite du Grand-Duché de Luxembourg. In 2007 he received the Silver Insignia of the City of Würzburg. In 2010 he was awarded the Laurea Honoris Causa in International Economic Integration from the University of Pavia. In 2011 he received the Gustav Stolper Award of the Verein für Socialpolitik. In 2004 he received the International Price of the Friedrich-August-von-Hayek-Stiftung, in 2004 the Bernhard-Harms-Medal of the Institute for World Economics, Kiel, 2005 the Hans-Möller-Medal of the University of Munich and 2006 the Ludwig-Erhard-Preis für Wirtschaftspublizistik. Issing received honorary Professorships from Goethe University Frankfurt (2007) and the University of Würzburg (1991) and honorary doctorates from the Universities of Bayreuth, Frankfurt and Konstanz. In 2017 he received Europa-Medaille Kaiser Karl IV. Issing is one of the members of the G20 Eminent Persons Group on Global Financial Governance. The Group was formally established by G20 Finance Ministers and Central Bank Governors on 21 April 2017. Furthermore, Issing headed the Advisory Council on a New Financial Order appointed by the German Chancellor Angela Merkel (2008-2012). He also was a member of the High Level Group of the European Commission chaired by J. De Larosière.